business activities. Deployment of VoIP and IP surveillance needs the network intelligence to separate the voice and video traffic from data, and prioritise them accordingly. However, companies do not necessarily have more money or advanced training to deal with complex managed switches. NETGEAR® ProSAFE® Gigabit Plus Switches meet this growing need by providing fundamental network features such as VLANs, QoS, and IGMP Snooping that will help optimise the performance of business networks. 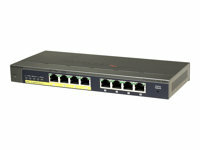 The GS105PE ProSAFE Plus switch is a 5 port desktop gigabit Plus switch that supports Power-over-Ethernet (PoE) and can power devices such as IP phones, IP surveillance cameras and wireless access points with just an Ethernet cable; perfect for low cost PoE deployments. ProSAFE Plus Switches are the perfect upgrade from the plug-and-play unmanaged switch, delivering essential networking features at a very affordable price. Typical campus, warehouse or large building IP telephony, Wireless or Video-Surveillance deployments require flexible and affordable Fibre aggregation. This 12-port Fibre platform with 12 combo Gigabit ports, provide PoE+ as well – whenever and wherever you want – even far from the MDF or typical wiring closet. Because PoE deployments are always restrained by 100-metre copper limitation, such low-port count Fibre solution will simplify architectures and even power local PoE+ devices. High-speed, Layer 2 managed gigabit switching NETGEAR delivers wires-peed gigabit performance and a full set of Layer 2 management features with unsurpassed affordability. 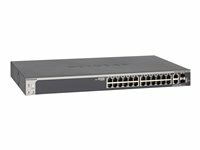 This high-speed switch delivers maximum throughput where you need it - to high-performance workgroups at the edge of the network, or as a backbone for 10/100 switches and gigabit servers in demanding small networks. The non-blocking design offers full gigabit throughput simultaneously to all 12 10/100/1000 ports to ensure reliable performance. Layer 2 management functionality delivers reliability, control, and availability. 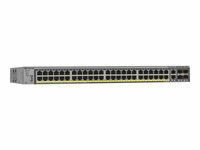 Powerful A full 12 10/100/1000 ports and a non-blocking design provide wire speed throughput and maximum bandwidth for the most demanding network environments. 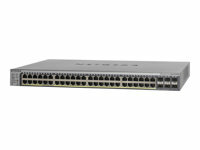 The 12 combination ports of Gigabit Ethernet interfaces provide the flexibility to deploy fibre or copper connectivity within your network environment. Small Form-factor Pluggable (SFP) modules deliver 1000Base-LX optics. The Layer 2 management features optimize bandwidth throughout the network - delivering gigabit performance to systems, applications, and services. Take advantage of forwarding rates up to 17.8 million pps, and a switching capacity of 24 Gbps. Easy to use Move up to gigabit power in minutes. Use the GSM7212F as a managed switch out of the box - just Plug and Play! All ports are auto-negotiating and support Auto Uplink technology. Management features are simple to set up and use, with a browser interface for easy configuration. Comprehensive remote administration capabilities reduce the need for on-site administration. Easy to troubleshoot - built-in testing capability locates cable related network problems. Manageable Meet your management needs with SNMP (v1, v2c and v3), RMON, Command-Line Interface (CLI) and a complete web-based GUI. Advanced features include up to 256 VLANs, DiffServ traffic prioritization and 802.1p (QoS) for Voice over IP services (VoIP), broadcast storm protection, RADIUS, 802.1x, port trunking, port mirroring, rapid spanning tree, and link aggregation. Full Layer 2 implementation allows you to configure your network for maximum performance, reliability, and availability. 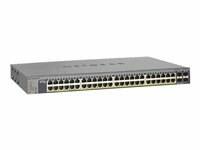 Powerful Full 24 10/100/1000 ports and a non-blocking design provide wire speed throughput and maximum bandwidth for the most demanding network environments. The Layer 2 management features optimize bandwidth throughout the network - delivering Gigabit performance to systems, applications, and services. Take advantage of forwarding rates up to 71.4 million pps, and a switching capacity of 96 Gbps. Easy to use Move up to Gigabit power in minutes. Use either of these solutions as a managed switch out of the box - just plug and play! All ports are auto-negotiating and support Auto Uplink technology. Choose from two easy-to-use management interface options - Web interface or a command line interface available through console or telnet. Comprehensive remote administration capabilities reduce the need for on-site administration. Manageable Meet your management needs with SNMP (v1, v2c and v3), RMON, Command Line Interface (CLI) and completely redesigned Web-based GUI, ProSafe Control Center. Advanced features include up to 512 VLANs, DiffServ traffic prioritization and 802.1p (QoS) for Voice over IP services (VoIP), broadcast storm protection, RADIUS, 802.1x, port trunking, Rapid Spanning Tree, and link aggregation. Outstanding These products offer Layer 2 management and full Gigabit power at a compelling price. Use at the edge to improve workgroup connections, or at the core to upgrade a Gigabit Ethernet backbone - now you can afford the power your network deserves. 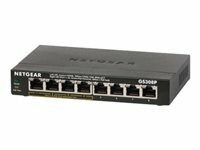 NETGEAR's Intelligent Edge M4100-26G-POE is a fully managed 24 port Gigabit switch with 2x Gigabit and 4 shared SFP ports. The M4100-26G-POE has 24 ports of POE (802.3af), perfect for Wireless access points, IP telephony, CCTV and video-surveillance deployments. They are ideal for all organisations considering reliable, affordable and simple access layer switching with CLI scripting, Layer 3 static routing as well as PoE scalability. As a cost-effective component of converged voice, video and data networking solutions, NETGEAR M4100 series delivers a secure, intelligent edge in commercial buildings and large campus LAN environments.